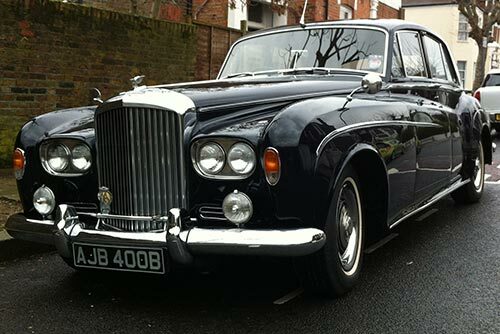 A classic Bentley once owned by The Beatles’ manager Brian Epstein is to be sold at Coys famous Coys Spring Classics sale in London on March 11th. Known as “Mr. 25%”, referring to Epstein’s cut of The Beatles’ gross earnings, it is estimated that he earned £75 million in today’s money. One of the things he did was spend some of that income on buying this car to replace his second hand Bentley S1. First registered on 18th February 1964, this was Epstein’s first brand new Bentley and still bears the original AJB400B registration number. He had ordered it in late 1963, placing the order through R.S. Mead Ltd of Maidenhead. The car was then collected from the dealer by Derek Taylor and Lonnie Trimble, Brian’s valet/chauffeur, as he was in the USA with The Beatles. George was referring to Brian’s new Bentley S3 which was sitting outside the airport’s Kingsford-Smith VIP suite. In October 1965, Epstein sold the Bentley S3 and it passed into the hands of Sidney J. Dicks Ltd. Subsequent owners include a London solicitor, Mr. Levinson, and Norman Boyack, a theatrical agent. In the same ownership for over 25 years, the car has a thick history file, detailing a bare metal re-spray as well as piston ring replacement and engine overhaul. The file also has copies of the original History Sheet and chassis listing, DVLA and previous-owner correspondence, copies of press cuttings and marque-related literature, copy of the owner’s manual and a quantity of expired MoTs and tax discs. The car is currently taxed and MoT’d and comes with current V5C registration document. The original radio has been converted to FM and comes with a tool kit with jack and spare wheel. Coys Spring Classics auction takes place at the Royal Horticultural Society, London, on March 11th.